1. US local registered Brand with professional products line-up and after-sales service. 2. We provide 24 hours on-line technology customer support for customers. Only suport T-Mobile; recommend carriers: Speedtalk Mobile in US. 2.If the GPS Kids watch didn't work/ device offline,please check if you choose the correct area when you register the APP firstly.In US need choose "North America"
4).Send APN codes Setup SIM data netwrok by SMS via Parents' Phone Message app to Kids Watch. For Speedtalk original SIM , just copy bellow SMS to avoid input wrong. For Speedtalk(MobileNet SIM) , just copy bellow SMS to avoid input wrong. 4.When you insert a SIM card, the watch needs to be turned off. 5.Set the SOS number: Set 3 numbers, watch the SOS button in emergency, and alarm after 3 seconds, then dial 3 numbers in the loop. When no one answers, circle two rounds to end. 6.This smartwatch only has a 24-hour format!!! 7.If have any issue, please contact us, we will help! ❤It can be used as a good gift for traveling back to school! 2018 New Gen Version: Micro SIM supported,IP68 Waterproof Protection,1.54inch with 240*240 HD resolution colorful screen,2.5D smooth quality touch panel,Rotating camera(2MP), Two-way calls, Multiple positioning(GPS+AGPS+LBS), Electronic fence, a key SOS, Curriculum, Voice chat, Multiple alarm clock(Analog clock face/12hour/24hour system optional）, Remote monitoring. ‍♂️: Health Fitness Tracker: Our S8 Watch Build in a Health Monitor Pedometer, parents can switch it on APP. Included Step Count / Exercise / Distance / Sleep Monitor. Help your kids to cultivate sport fitness activity habits.Activity tracking to help you know your child everyday health status. You can inspire your child by pushing reward through APP.  SOS EMERGENCY CALL FEATUR: Press SOS key for 3 seconds in any model. You can set 3 phone numbers in it and when you press it, it will call 3 SOS phone numbers alternatively in 2 rounds until answering the call. 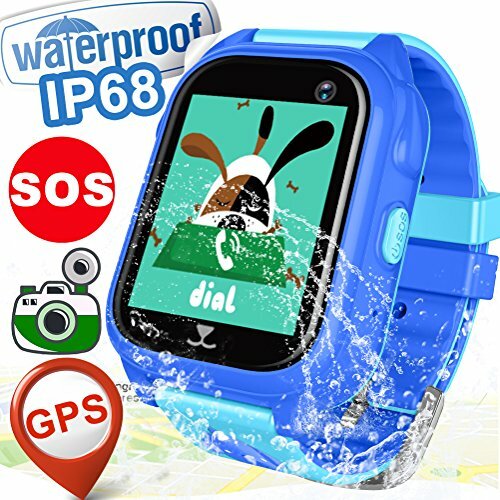 When in distress , your kid can use this smart watches boys GPS to inform you thanks to an intuitive SOS feature. This is so important in an emergency situation. If you have any questions about this product by Hyanwoo, contact us by completing and submitting the form below. If you are looking for a specif part number, please include it with your message.